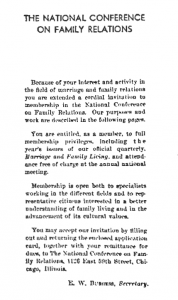 ¶ 1 Leave a comment on paragraph 1 0 Membership in the state and regional conferences continued to grow, and reports of their meetings were detailed in the Spring issue of Living (Vol. 2, No. 2). ¶ 2 Leave a comment on paragraph 2 0 The Award of Merit in 1940 was given to Katherine F. Lenroot, Chief of the Children’s Bureau, for her distinguished service in the field of family relations.